Napoleon’s only legitimate son, Napoleon François Charles Joseph Bonaparte, also known as the King of Rome, was born on March 20, 1811. By all accounts he was a cute, strong-willed and kind-hearted little boy. He was also greatly spoiled. Here are some anecdotes of the King of Rome as a young child. This anecdote comes from Captain Jean-Roch Coignet, a grenadier of Napoleon’s guard. The incident probably happened within the first year of the child’s life. The precious child was always accompanied by the governor of the palace, whenever he went out to take the air, with his handsome nurse, and a lady who carried him. One day when I was at the palace of St. Cloud, Marshal Duroc, who was with me, signalled to me to approach, and the dear child held out his little hands for my plume. I stooped, and he began to pull at my plumes. The marshal said, ‘Let him do it.’ The child laughed with delight; but my plume was sacrificed. I looked a little upset. The marshal said to me, ‘Give it to him. I will give you another.’ The maid of honour and the nurse were much amused. This anecdote was related by a palace usher to Laure Junot, the Duchess of Abrantès (not the most reliable memoirist). Madame de Montesquiou was the King of Rome’s governess. This anecdote appeared in the memoirs of the Count de Las Cases, who accompanied Napoleon into exile on St. Helena. The apartments of the young Prince were on the ground floor, and looked out on the court of the Tuileries. At almost every hour in the day, numbers of people were looking in at the windows, in the hope of seeing him. One day when he was in a violent fit of passion, and rebelling furiously against the authority of Madame de Montesquiou, she immediately ordered all the shutters to be closed. The child, surprised at the sudden darkness, asked Maman Quiou, as he used to call her, what it all meant? Here’s another anecdote from Madame Junot. The Emperor had given orders that his son should always be accessible to those in misfortune who wished to make any application to him by petition. The petitioners were immediately introduced, and they proved to be a young widow and her son. Her husband had died about three months previously of wounds received in Spain, and his widow solicited a pension. 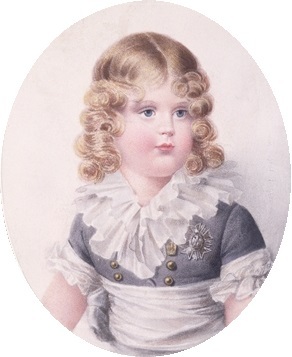 Madame de Montesquiou, thinking that this conformity of age between the little orphan and the young King might move the feelings of the latter, placed the petition in his hands. She was not deceived in her expectations. His heart was touched at the sight of the young petitioner. The Emperor was then on a hunting-party, and the petition could not be presented to him until next morning at breakfast. Young Napoleon passed the whole of the day in thoughtfulness, and when the appointed hour arrived, he left his apartment to pay his respects to his father. He took care to present the petition apart from all the rest he carried, and this of his own accord. On January 24, 1814, the King of Rome saw his father for the last time. Napoleon left to campaign in Germany, in a failing attempt to prevent his enemies from entering France. 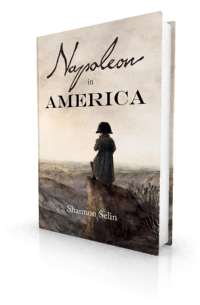 On March 28, as the allies closed in on Paris, Napoleon wrote to insist that his wife Marie Louise and their son leave the city. Marie-Marguerite Broquet, the mother of Napoleon’s valet Louis-Joseph Marchand, was a nurse to the King of Rome. She told Marchand how the boy resisted leaving the Tuileries Palace. When Napoleon was exiled to Elba, Marie Louise took the King of Rome to Vienna. He spent the rest of his life there, in the court of his grandfather, Emperor Francis I of Austria, who gave him the title of Duke of Reichstadt. That is where Napoleon wants to retrieve him from in Napoleon in America. Jean-Roch Coignet, The Note-Books of Captain Coignet, Soldier of the Empire, edited by Jean Fortescue (New York, 1929), pp. 200-201. Laure Junot, Memoirs of Napoleon, His Court and Family, Vol. 2 (London, 1836), p. 334. Emmanuel-Auguste-Dieudonné de Las Cases, The Military and Political Life, Character, and Anecdotes of Napoleon Bonaparte (Hartford, 1823), pp. 340-341. Laure Junot Abrantès, Memoirs of Napoleon, His Court and Family, Vol. 2, pp. 335-336. Louis-Joseph Marchand, In Napoleon’s Shadow: Being the First English Language Edition of the Complete Memoirs of Louis-Joseph Marchand, Valet and Friend of the Emperor, 1811-1821, edited by Proctor Jones (San Francisco, 1998), pp. 81-82. I felt sorry for the little chap. Born in 1811, by 1814 he was already kissing his father goodbye for the last time. No wonder he didn’t want to leave Tuileries Palace – it was all he knew. Hopefully Emperor Francis treated them well in the Austrian Empire. The emperor loved his daughter, but probably not his son in law. I feel sorry for him too, Hels. He became much less spoiled in the austere court of Vienna. Francis I loved his grandson, but regarded him (and all of his family) as a pawn of state. Thanks, Christoph. That’s very kind of you. According to the theory of genetics, there was only a slight probability that N II would inherit the great qualities of N I, and of course he did not. In both appearance and temperament, it does seem like he took after his mother.